How do you keep donors and turn one-time donors into loyal supporters? With effective donor thank-yous. Don't think for a minute that thank-yous are just for donations. You should be thanking supporters for whatever they do, such as attending an event or taking a survey or volunteering. Here are several ways to get your email thank-you opened and to wow your donor. Use a subject line in your email that jumps off the screen. In this email thank-you (shown above) from Charity: water, the subject line read: "We hit our September Campaign goal!" Since I remembered contributing to that campaign, I was thrilled to learn that I had made a difference. The goal was met. Make the donor the star. 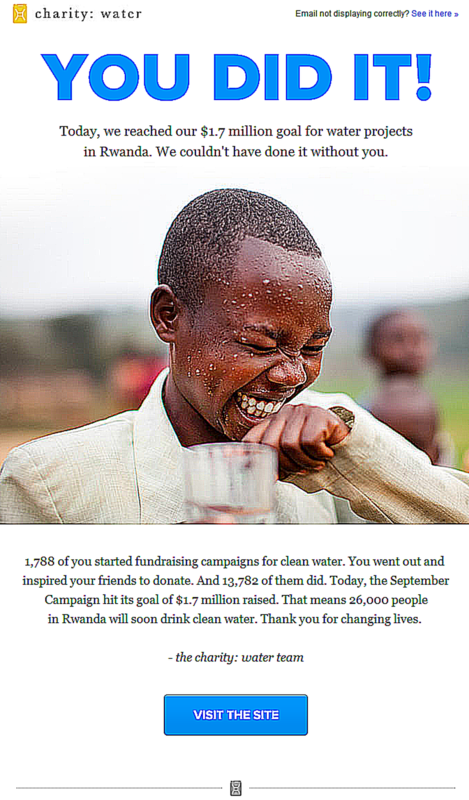 Charity: water does that in the big headline at the top of its email: YOU DID IT! Plus, the word "you" or "your" is used five more times in this short thank you note. Tell the donor the results and be specific. that 26,000 people in Rwanda got clean water. The specificity even extends to sharing the number of individuals who fundraised (1,788) and the number of people who donated (13,782) as a result. This creates a feeling of belonging to a very special group of people and emphasizes the multiplication factor of every person's effort. Charity: water is renowned for its attention to imagery, and this thank you is no different. It shows one child enjoying water. There is no excuse for not including an image in an emailed thank-you. Images are super easy to add. Make sure the image is a person (or animal if that is your focus), is tightly framed, and is large. You could also include a video, as long as it focuses on someone who benefits from the donor's generosity and is simple. Make the video accessible from within the thank you message. No clicking off to another place. The Imagery of one person is stronger than a group of people, and a person or group is stronger than charts, graphs, or infographics. Include a link to more information. Focus on keeping the thank-you as straightforward and heartfelt as possible, but do provide a way for the donor to get back to your homepage or some other landing page that will pull him or her into more action. This thank-you from charity: water got me pretty excited and ready to do more. Email thank-yous take many forms, depending on the circumstances. Notice that this thank-you from Charity: water ignores much of conventional wisdom about thanking donors. It is not personalized, and it does not serve as a receipt for my particular donation (an earlier email acknowledgment did that at the time I donated). But it is an excellent way to cap off a campaign and report back to donors. So many times charities forget to get back to donors to let them know what they accomplished in very specific terms. There are many ways to report back to donors, such as through newsletters and annual reports, but those often arrive long after the glow of giving has faded. Charity: water’s model is a good one for completing the giving circle and re-energizing donors to do even more. The organization ran a time-limited campaign, with a particular goal, and then was able to report back quickly, combining that with a thank-you. MercyCorps nails it in the wake of a disaster with this email thank you that reports back on what its donors accomplished with their gifts. This note is heavy on facts, rather than a story, but in light of the disaster involved, that approach works well. That's the number of people we've reached with emergency relief in just one month since the Nepal earthquake--thanks to dedicated supporters like you. Our team began delivering emergency supplies to survivors just two days after the April 25 quake. The conditions have been precarious and challenging--aftershocks, heavy rains, landslides. But they are determined to reach people in need as quickly as possible each day. What: Food and emergency supplies like blankets, clothing, tarps, water purification liquid, solar lamps, cooking utensils and hygiene supplies. Where: The hardest hit areas, including Kathmandu, overlooked village on the periphery, and remote regions. How: We spoke with survivors to identify their urgent needs sourced supplies locally whenever possible, and compiled kits based on what was needed most. With your support, we're continuing these relief efforts because the smallest items make a world of difference to a family after an emergency. And we're looking ahead to the challenges and solutions to rebuild. I loved this thank you from Convoy of Hope after the Joplin tornado. It focused on the disaster I intended my donation for, included a story about a survivor, and is very donor centered. Notice the several “thank yous” and “because of you.” Also, the note tells me what happened as a result of my gift. Thank you for your gift of $__. Convoy of Hope has deployed trucks and teams to Joplin, Mo. Our prayers go out to the families in Joplin who lost loved ones, homes and businesses. Because of friends like you, Convoy of Hope was able to immediately deploy teams and emergency relief supplies to aid victims of these massive storms. Thank you! Your financial gift helped people like Rachael, who lost her home and had no food for her children. Convoy of Hope workers supplied Rachael and her family with food, water and hygiene products at one of our distribution sites just outside Birmingham, Ala.
“When you have kids and you don’t know how you are going to feed them, it means so much to know there are people here to help,” says Rachael. Thank you for your gift of $__ to Convoy of Hope. It is the donations, such as yours, that equipped us to help in Japan, continue our work in Haiti, and all our other outreaches as well. Because of friends like you, our disaster responders have deployed to the region where they will purchase and distribute life-saving food, water and supplies in cooperation with our in-country partners. With your help, we will reach even more families and children in need here at home and around the world this year. A short thank you works great too. This one from Save the Chimps is warm and donor centered. But this organization goes all out in the thanking department. After I had donated I landed on a sweet ​post donation page. Then I got a plain vanilla receipt by email, and then this much nicer one. All of this was instant. A well planned thank you process is always impressive. On behalf of all of us at Save the Chimps, thank you for your recent gift of $____. Save the Chimps, the world's largest sanctuary for rescued chimpanzees, cares for over 250 chimpanzees. Your donation will be used to provide the best in meals, enrichment and care to our resident chimpanzee families. It is your generosity and support that makes our work possible. On behalf of everyone at Save the Chimps, especially the chimps, thank you for your compassion and support. P.S. Speak out for them by sharing on Facebook and telling your friends about Save the Chimps. Political campaigns know that donors and supporters have to be continuously encouraged to participate ... right up to election day and beyond. Thank you. Yesterday was an amazing first day for our campaign – better than I could have possibly imagined. It’s about the millions without health insurance and more who pay outrageous costs for prescription drugs. It’s about a dramatically changing climate and scientists’ belief that we have a limited amount of time to act. It’s about the desperate need for campaign finance reform to level the playing field between working people and the corporations and billionaires who have been buying our elections. Take my short survey and tell me about the issues you care about – the issues that impact your life. I’ll review the results. Your participation will help us run a stronger campaign. I am so excited for the campaign ahead. It means the world to know that we’re in this together. It’s our only chance.